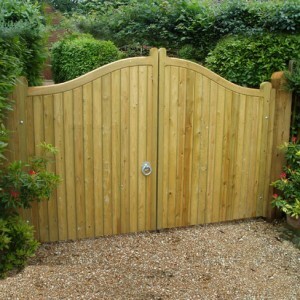 Tonbridge Fencing are wooden gate specialists. Our senior gate maker has been with us for over 38 years and has made gates and fences to an extremely wide range of sizes, types and specifications. Our experience and expertise means our team can provide anything from a simple timber garden gate, right up to a sophisticated pair of ornate hardwood gates. Our managers and erectors have many years of practical experience, and are able to advise and help you choose exactly the right type of gate, positioning, and operation to fit your requirements. 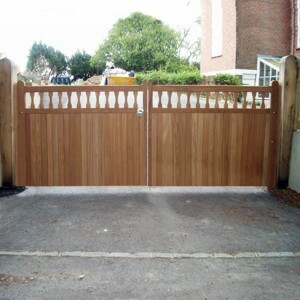 We produce both wooden and steel gates to suit many applications. So to secure anything from a garden, driveway, field, swimming pool or commercial property (including schools and industrial premises) if it’s a gate you want, we are the experts. 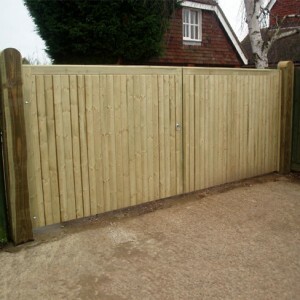 The Kent Gate Softwood can be hung as a single gate (as shown) or as a pair. 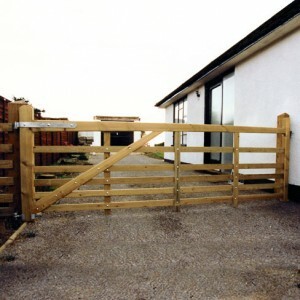 It is an ideal gate for use on driveway entrances or in more agricultural environments. A traditional style gate that makes an attractive alternative your standard universal field gates. Constructed with 5 horizontal rails, vertical supports (positioned between the two end stiles) and built in brace from the hanging stile. As we manufacture all our own gates, non standard sizes can be produced to suit your requirements, in either prepared softwood or Iroko hardwood. The Universal Premier gate is the perfect gate to use as an entrance gate or driveway gate. Manufactured from planed Softwood or Iroko hardwood, the universal gate has diamond pattern brace which means the gates can be hung a viewed from both sides. 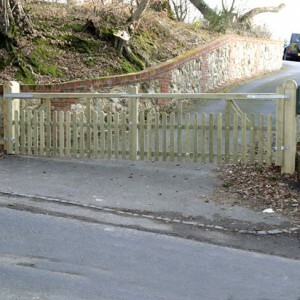 The Sussex Gate is a variation of our standard Kent Gate. Instead of 5 rails, this gate includes 6 rails that are spaced close together at the bottom of the gate; this makes it suitable if you are trying to contain small animals or children. The perfect driveway entrance gate or field gate for your property and surrounding land. 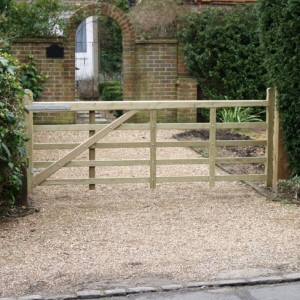 Choose the Wealden Gate as an attractive alternative to the standard field gate. Manufactured in a distinctive style with vertical palisade slating that offers an open clad bottom to the gate, these Wealden Gates are only available in widths up to 2.4m due to the open structure of gate. Can be hung as a single leaf gate or as a pair for a driveway or field entrance. 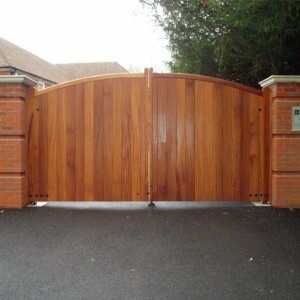 The Yeoman Gate is one of our most popular premiere gates. It is originally a traditional field gate style, this yeoman style includes an iconic extended hanging style with a kind of a hockey stick characteristic. It is this feature along with its long diagonal brace which runs the whole length of the gate, that gives this gate its very elegant but also traditional country feel. The Yeoman gate can be hung as a single leaf or hung as a pair with a large gate combined with a small pedestrian access gate. Attractive alternative to standard driveway entrance gate. Solid Swish Top Gates. Our pair of Cranborne gates are our most popular pair of gates. With their elegant swish top swooping up from the sides of the gates to get higher in the centre. 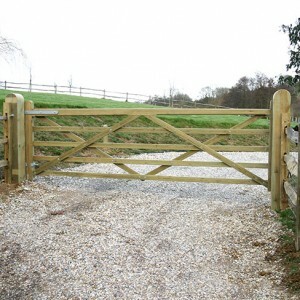 They are solid, durable and attractive timber drive gates. Mortised and tenoned gate frame provides a strong sturdy gate. Available in pressure treated tanalised softwood or Iroko hardwood. Solid curve top Sherborne Gates are built on a mortised and tenoned, ledged and braced sturdy gate frame. They are another popular style of gate in our heavy frame gate range. The Sherborne has the same solid top rail as our other tongue and groove (TGV) gates, but the top rail is beautifully curved. Starting lower on the outside and raising up in the centre. Clad in thick TGV (tongue and groove) and fully Tanalised pressure treated. Available in softwood or Iroko hardwood. 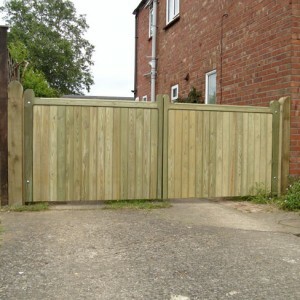 The Wimborne gate is one of our best selling pairs of gates. The heavy frame flat top Wimborne gates offers stability and durability, while the hand finished frame is a great example of our workmanship involved to produce these items. Manufactured on a mortised and tenoned, ledged and braced frame clad in thick TGV (tongue and groove) which is routed into the solid top rail. Softwood gates are Tanalised pressure treated. The Metal Frame Richmond Gate is a timber clad, metal frame gate. The timber board is constructed around a galvanised metal frame. The gate is boarded both sides with a TGV (tongue and groove) finish. 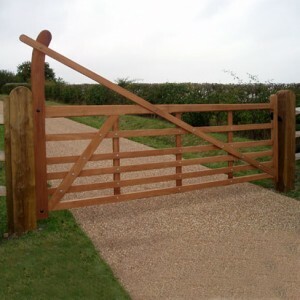 This produces a gate of a very sturdy timber appearance gate, but being built around a metal frame it allows a single gate up to a width of 2.4m wide. The Richmond gate is available in flat, curve or swish top options. Solid TGV gate with Balustrade infill detail. The Windsor gate is made from thick mortised and tenoned frame, ledged and braced clad in Tanalised softwood TGV . With an open top spindle section which allows you to see through the gate but still stay and feel secure with the solid TGV (tongue and groove) bottom section of the gate. With hour glass spindles as standard and flat solid top, curve, scalloped or swish top all available to suite your requirement. Available in softwood or Iroko hardwood.